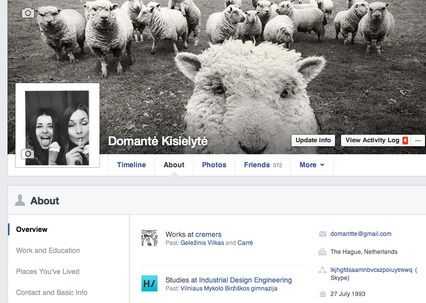 Here we go, my profile in Facebook - the website which goes to my top 3 or top 5 most visited ones. Facebook is the only one website I use where I interact with other users, another websites I use are designed to collect and share diverse information. For example I browse in www.stumbleupon.com or www.boredpanda.com. I use those websites not only to gather information for my studies or work, but also to relax my brain from thoughts. There are a lot of different websites with the same purpose as mine mentioned but I chose these ones because I find them the most real (by saying “the most real” I mean that I find almost every article interesting for me in different ways. Maybe the creators’ of the website target market is people with the thinking like me). Guys, you should check those websites, we are studying the same programme for the reason!) By the way, maybe you also know some ‘cool’ but useful websites I can browse for the information in? Furthermore, I use Slack, but its not MY online space, i can call it OUR online space, because I use it with my group only. In order to find out about what’s going on in the world from other angle i used to use 9gag, but now it’s not funny anymore.